Faced with a debilitating illness that would eventually lead to a wheelchair, these repeat clients came back 25 years after completing their kitchen remodel and sunroom addition. This time, they asked to reconfigure the first floor for greater accessibility. 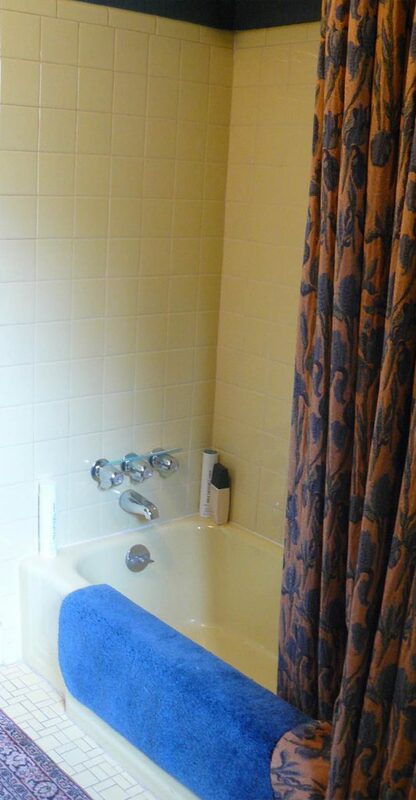 A hall bath was transformed into a powder room, allowing additional square footage to expand the master suite. 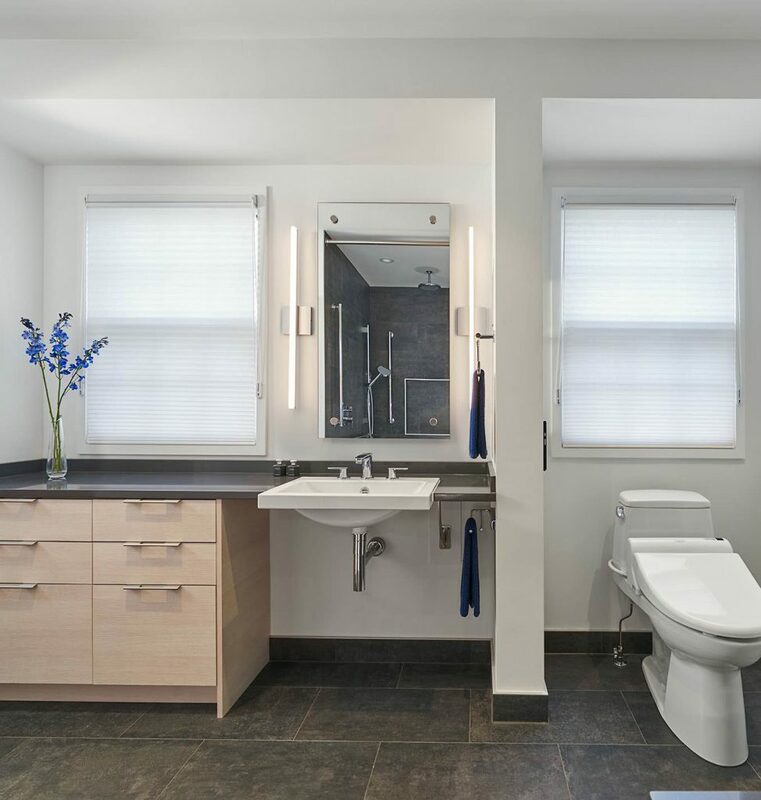 In the master bath, shallow-depth pine cabinetry and quartz counters make for easy seated use. 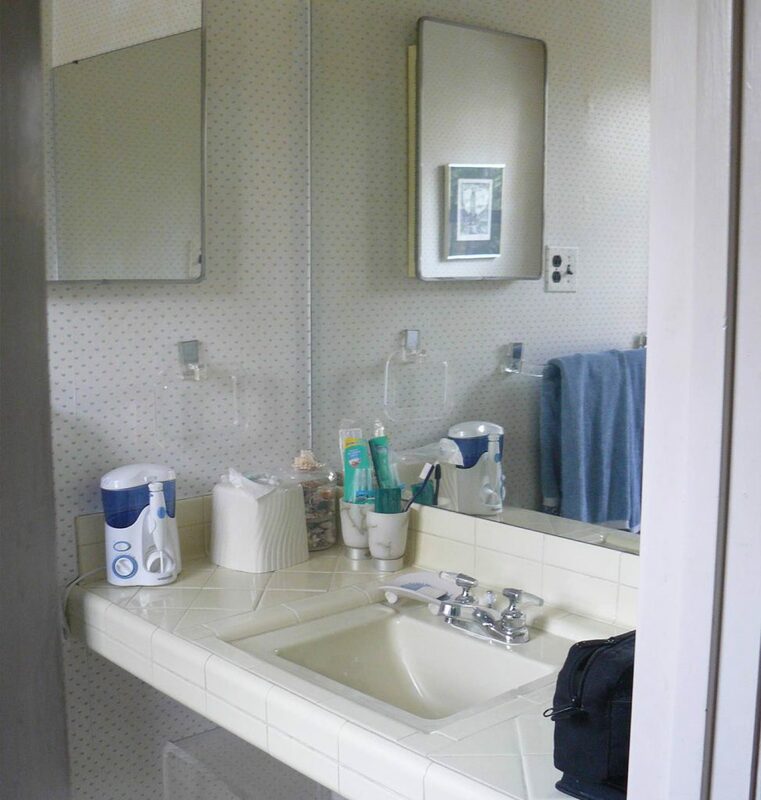 A narrow partial wall—with a simple cutout for storage or display—separates the vanity from the toilet. 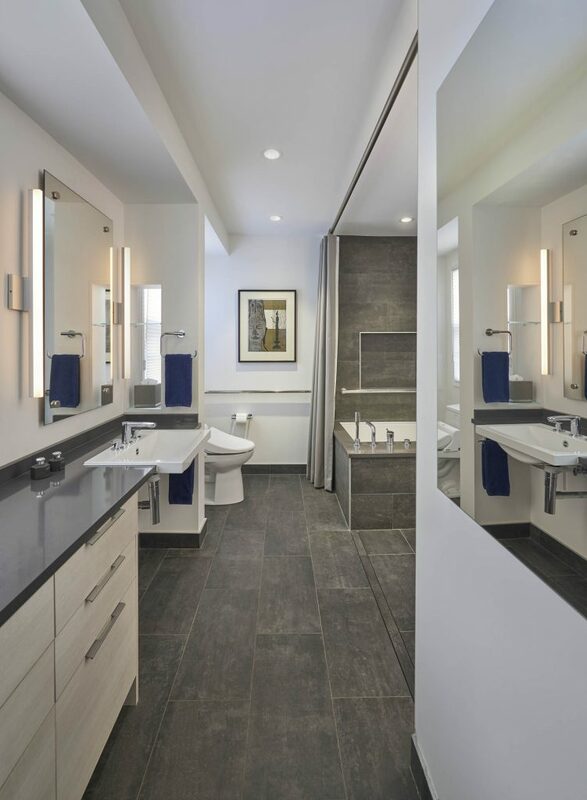 The entry’s thin-profile mirror adds light and depth to the space, while reflecting the room’s clean visual lines. A thin extended basin can now be wheeled under effortlessly with a lowered hand towel rack within easy reach. Low-maintenance LED lighting around the mirror adds bright illumination for aging eyes for many years to come. 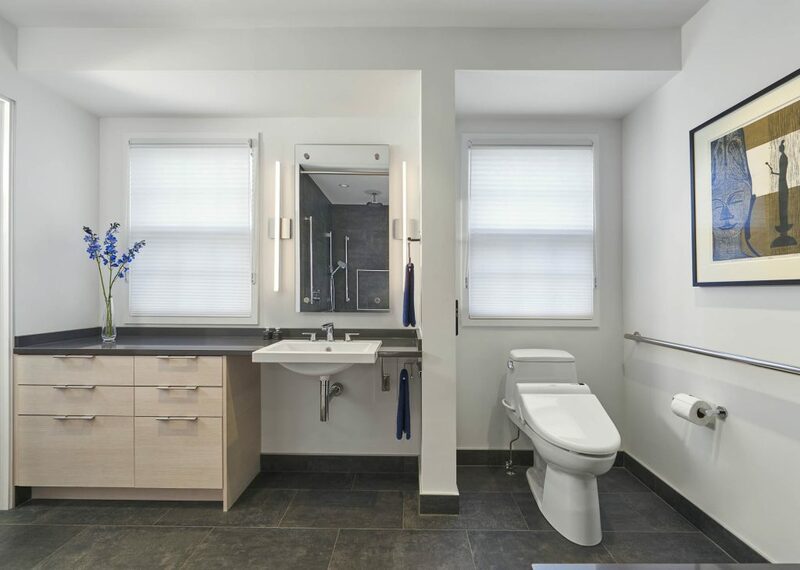 The self-sanitizing bidet-combo toilet enhances both care and comfort in personal cleansing. 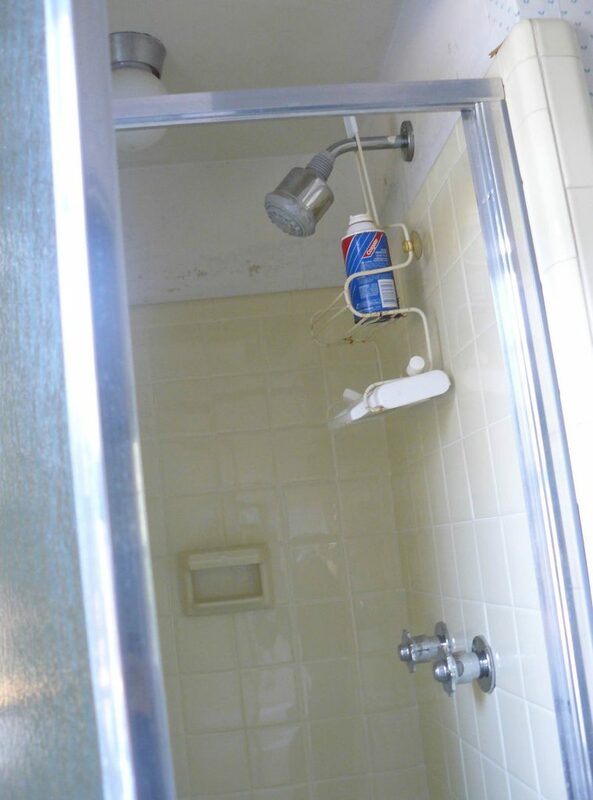 The need for barrier-free entrance to the shower created a challenge. The answer: a linear drain amid imperceptibly ramped tiles that direct the water downward without modifying the floor system. 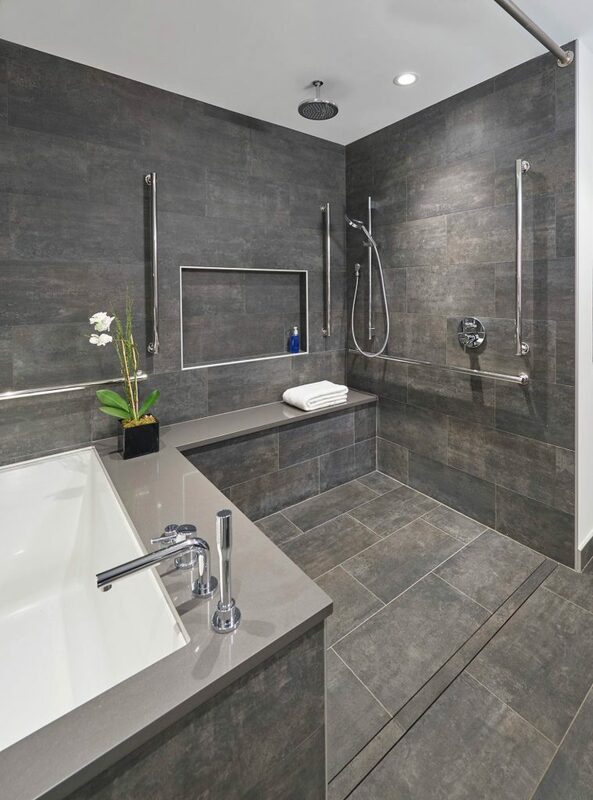 Our careful procurement of attractive, accessible materials keeps this bathroom feeling upscale instead of clinical. Throughout the bath, elegant grab bars in polished chrome look delicate but provide needed stability from any position. A large, right-angled quartz bench acts as both a seat for the shower as well as a secure entry into the ample soaking tub. 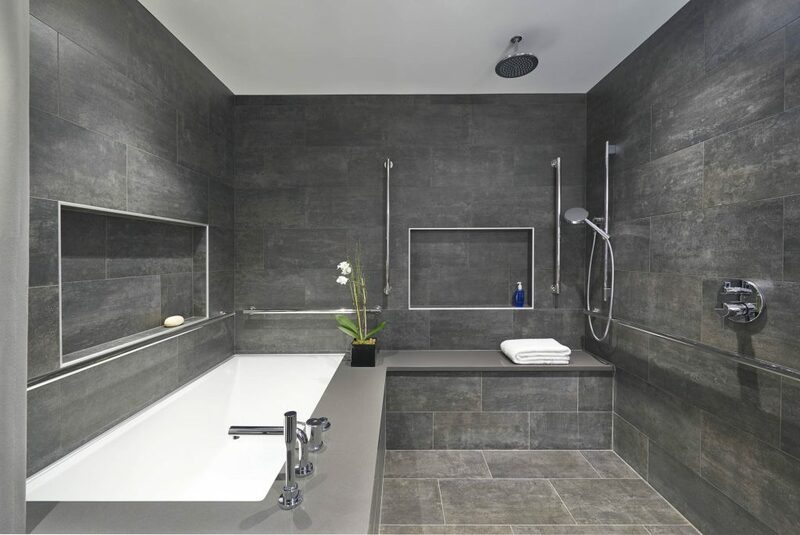 Large-format, slip-resistant porcelain tiles help create the bathroom’s organic, cohesive look. 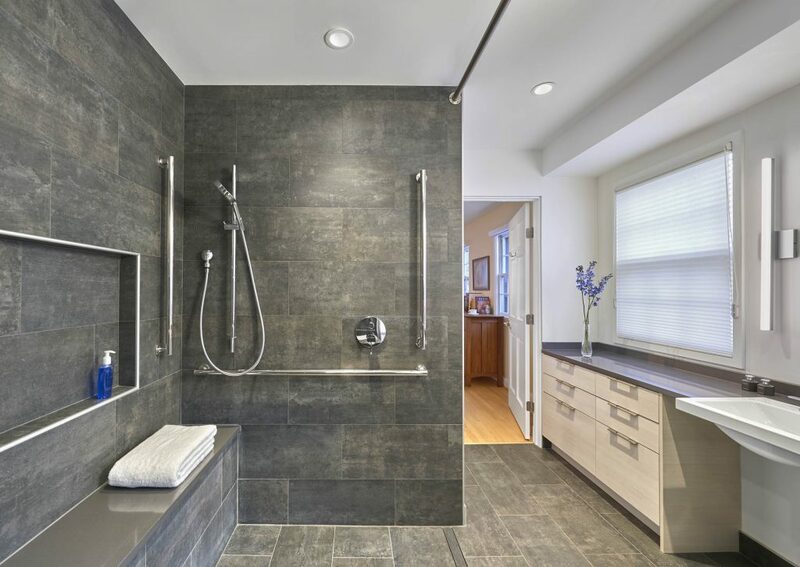 The flush linear drain allows for a dramatic doorless shower. A rain shower head from the ceiling provides a spa-like experience, while the thermostatic hand shower ensures an easy, temperature-controlled rinse from any angle. 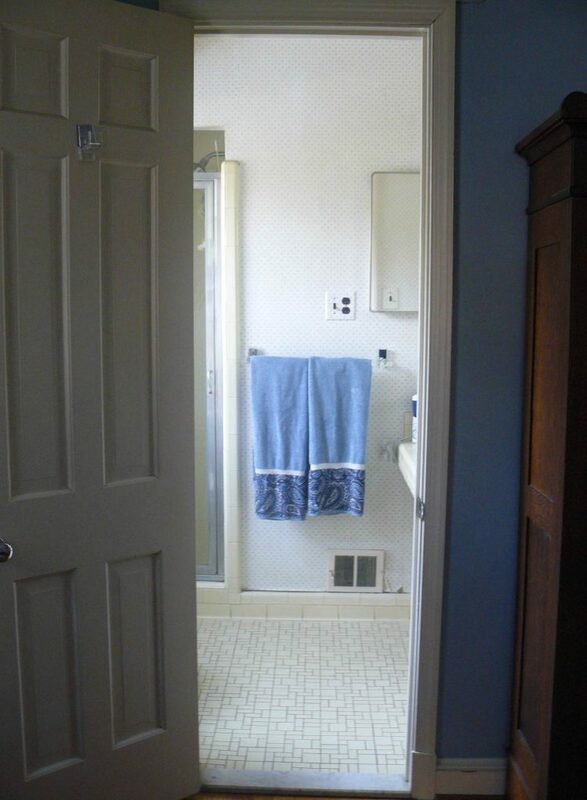 The guest hall bath—reconstructed into a smaller powder room—frees up square-footage for the master bath and closet. 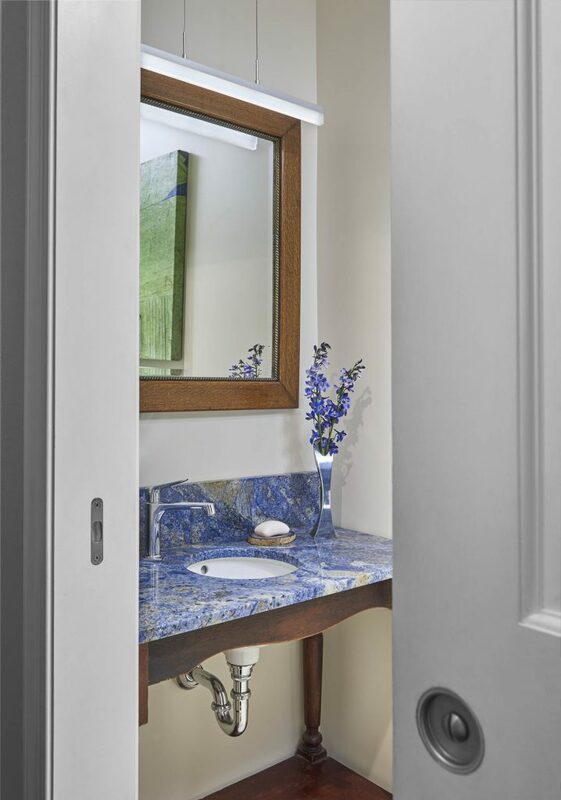 The clients treasured the existing Azul Bahia granite vanity, so it was carefully repurposed in the new space. The widened pocket door provides easy entry and access. A recessed display niche adds depth and interest on the woven wallpapered accent wall. 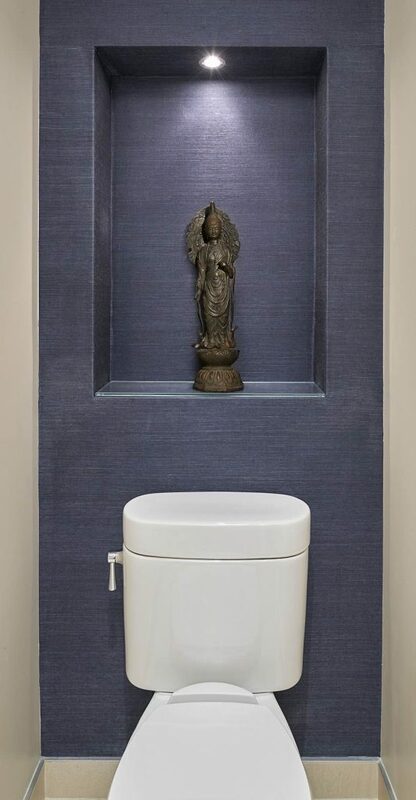 The alcove allows for the necessary plumbing to channel water behind it while providing a perfect focal point for decorative objects.